Who is but the form following the function of what; and what I am is a man in a mask. I’m not questioning your powers of observation. I’m merely remarking upon the paradox of asking a masked man who he is. But on this most auspicious of nights, permit me then, in lieu of the more commonplace sobriquet, to suggest the character of this dramatis persona. In view, a humble vaudevillian veteran cast vicariously as both victim and villain by the vicissitudes of fate. This visage, no mere veneer of vanity is a vestige of the vox populi, now vacant, vanished. However, this valorous visitation of a bygone vexation stands vivified and has vowed to vanquish these venal and virulent vermin vanguarding vice and vouchsafing the violently vicious and voracious violation of volition. The only verdict is vengeance, a vendetta; held as a votive not in vain, for the value and veracity of such shall one day vindicate the vigilant and the virtuous. At least he admits he’s veering towards verbosity. 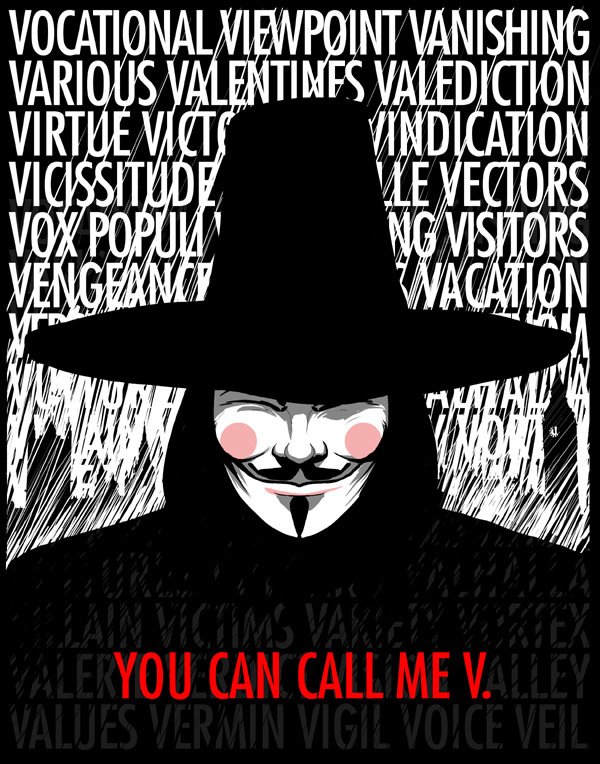 © V for Vendetta. In case you do not already know. This entry was posted in Uncategorized and tagged human-rights, politics on September 9, 2012 by vescucci.